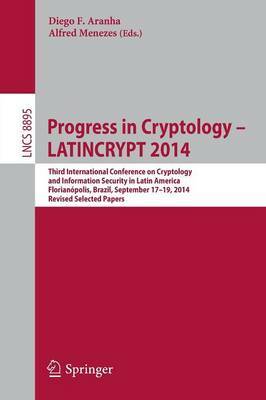 This book constitutes the proceedings of the 3rd International Conference on Cryptology and Information Security in Latin America, LATINCRYPT 2014, held in Florianopolis, Brazil, in September 2014. The 19 papers presented together with four invited talks were carefully reviewed and selected from 48 submissions. The papers are organized in topical sections on cryptographic engineering, side-channel attacks and countermeasures, privacy, crypto analysis and cryptographic protocols.